Ahead of New York City’s primary elections this Tuesday, The New York Times ran profiles of the up-and-coming Democrats challenging congressional incumbents. But the only anecdote anybody on social media could talk about involved 12th District candidate Suraj Patel, who’s taking on 13-term incumbent Carolyn Maloney. The 34-year-old lawyer has been catfishing potential voters by chatting with them on dating apps like Tinder, Grindr or Bumble. Patel and his staffers set up accounts on these apps featuring pictures of attractive people (usually not themselves). 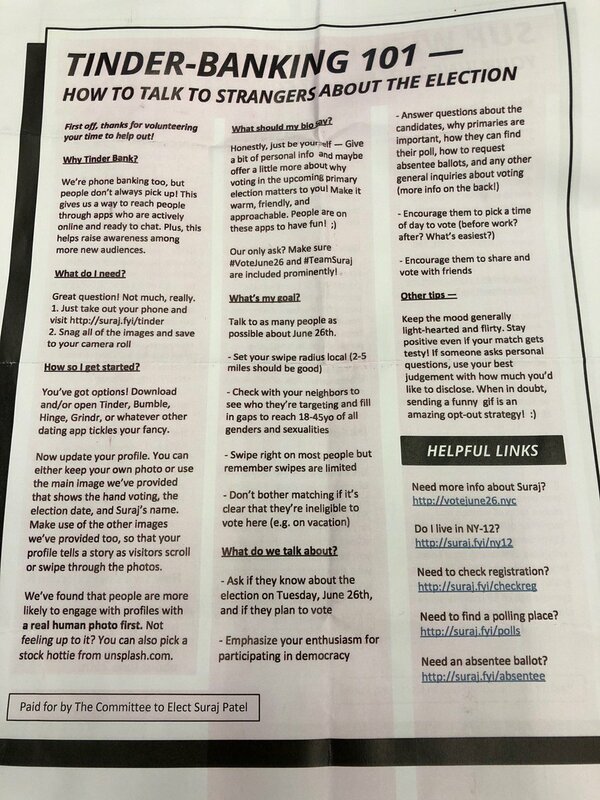 “You can also pick a stock hottie from Unsplash.com,” Patel’s “Tinder banking” cheat sheet reads. Then Patel starts swiping right on potential voters, and they can do the same to him. His “swipe radius” is two to five miles. Once he gets a match, Patel uses the pickup line, “Hi (Name). Are you into civic engagement?” Then he reveals who he really is. Looks like the Patel campaign also needs to worry about its online security. Patel, who also teaches business ethics at New York University, admitted there was an element of fraud to this approach. But he said the deception was worth it to get votes. Ironically, quite a few voters in Patel’s district find his behavior appalling. This is not something that should be replicated, and his judgment is a lot worse than I thought it was. I feel bad for the progressive voters who hoped he’d be an answer to political stagnation. He’s just a grifter. Ignoring the fact that you’re starting off your political cold calling with a lie by using a stolen photo, this shows a total lack of understanding of both dating apps and his own district. This isn’t the first time Patel’s online exploits have nearly derailed his congressional campaign. In March, The New York Post unearthed a 2012 Facebook post in which Patel posed with Olympic gymnast McKayla Maroney. “We went to Top Shop. I bought a promise ring. Then they tried to arrest me,” the photo caption read. Patel also commented on a false 2010 story which claimed actor John Stamos had an affair with a 17-year-old. “Dude, she was 17—that’s not that bad. Have mercy!” Patel wrote. We called and emailed Patel seeking comment on these issues. At first he didn’t send a formal statement, but we had an interesting interaction with his campaign spokeswoman Lis Smith. In our email to the campaign, we included one of the tweets linked above as an example of the criticism we were talking about. We sent her several other missives included in this story to show it was more than one tweet. She then sent a more formal statement. Update: After we pointed out the data security flaw, Patel’s campaign updated the Google Drive folder so only those with permission could upload files.